This is the definitive edition of the work of one of America's greatest poets, increasingly recognized as one of the greatest English-language poets of the twentieth century, loved by readers and poets alike. Bishop's poems combine humor and sadness, pain and acceptance, and observe nature and lives in perfect miniaturist close-up. The themes central to her poetry are geography and landscape—from New England, where she grew up, to Brazil and Florida, where she later lived—human connection with the natural world, questions of knowledge and perception, and the ability or inability of form to control chaos. This new edition—edited by Saskia Hamilton—offers readers the opportunity to take in, entire, one of the great careers in twentiethcentury poetry. 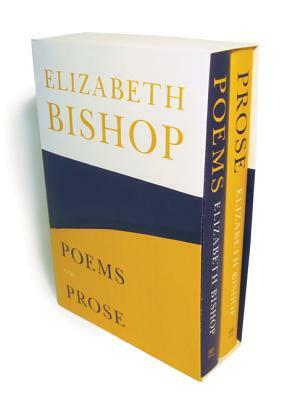 Elizabeth Bishop's prose is not nearly as well known as her poetry, but she was a dazzling and compelling prose writer too, as the publication of her letters has shown. Her stories are often on the borderline of memoir, and vice versa. From her college days, she could find the most astonishing yet thoroughly apt metaphors to illuminate her ideas. This volume—edited by the poet, Pulitzer Prize–winning critic, and Bishop scholar Lloyd Schwartz—includes virtually all her published shorter prose pieces and a number of prose works not published until after her death. Here are her famous as well as her lesser-known stories, crucial memoirs, literary and travel essays, book reviews, and—for the first time—her original draft of Brazil, the Time/Life volume she repudiated in its published version, and the complete extant correspondence between Bishop and the poet Anne Stevenson, the author of the first book-length volume devoted to Bishop. The modern American poet Elizabeth Bishop (1911-79) received the Pulitzer Prize in 1956 for her collection Poems: North & South. A Cold Spring, the National Book Award for The Complete Poems (1969), the National Book Critics' Circle Award in 1976, and many other distinctions and accolades for her work. She was born in Worcester, Massachusetts. She traveled widely as an adult, living for years in France and then Brazil, before returning to the United States.